We’re delighted to share a photo of our new installation at Peel Hall Primary School. The panels were installed in the final two weeks of the summer holidays and commissioned in early September. The installation has generated 3,870kWh clean energy already! You can see the generation for this week here. 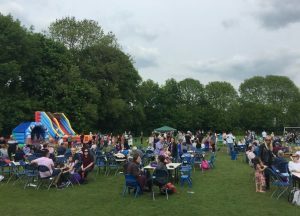 Given the sunny weather we had this summer, our four existing sites – Fiddlers Lane Primary School, Irlam Primary School, Primrose Hill Primary School and The Fuse – have performed very well. Generation meter readings taken in September 2018 show that these sites have generated a whopping 218MWh between them since they were first installed in 2016 – that’s enough to make 12 million cups of tea! GMCR is looking for a volunteer Finance Director to join our Board. Our day to day bookkeeping is outsourced; we are looking for someone who can support our strategic development with their financial knowledge and enthusiasm. The Board usually meets once a month either in person or by Skype. Our neighbours, Carbon Co-op, community energy efficiency specialists based in Manchester, are also looking for a volunteer Treasurer. They would love to have someone on board who feels confident to have financial oversight of the co-op, advising the committee on all aspects of finance. There will be a small amount of monthly admin. Their bookkeeping is outsourced. If you haven’t switched your home energy to a green supplier yet, you can compare prices at our Big Clean Switch page and if you decide to switch, GMCR will receive a small commission payment. Share offer update – Halfway there! We are delighted to have reached the halfway point after just 10 days – we’ve now raised £75,325 towards our target of £145,000 to fund solar panels for four more primary schools. Over the next couple of weeks, we’ll be holding stalls at various events including the Lowry Makers Market, and attending the Community Energy England conference on 23 June. Stop by and say hello if you see us! Please keep sharing our website and our video, and posting on Facebook and Twitter about the project. Share Offer update – A fantastic first week! 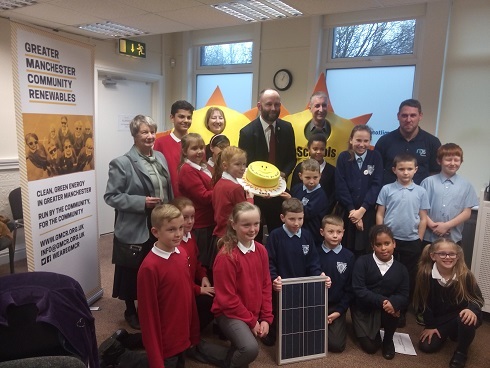 We were excited to open our new share offer on Tuesday and have been amazed by the support we’ve received for our project to install solar panels on four primary schools in Salford. We’ve already received applications for over £50,000 of shares! To be over one third of the way to our target by the end of week 1 is incredible – but there’s still a long way to go. Visit our Invest page to find out how you can help us reach our £145,000 target. 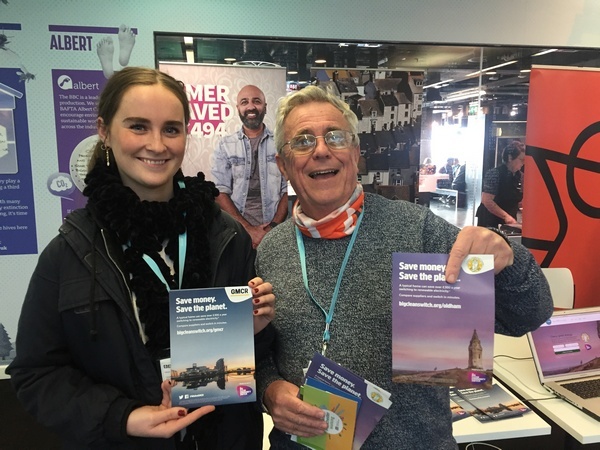 This weekend we were out promoting the share offer at Envirolution festival, Friends of the Earth’s Basecamp weekend, and at Patagonia as part of the King Street festival. 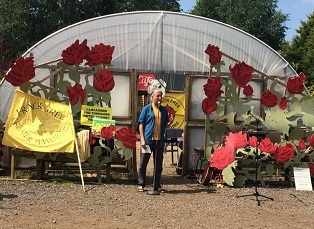 We have lots of activity coming up to promote the share offer including joining in on a canal bike ride from Manchester to Worsley on 7 June, and Manchester Friends of the Earth’s meeting on 12 June on the theme of Powering the Future. Finally, please continue to tell your friends and family about our share offer on Facebook, Twitter, or by sending them a link to our video. Wishing you a very happy and healthy World Environment Day! Invest in community-owned solar power today! 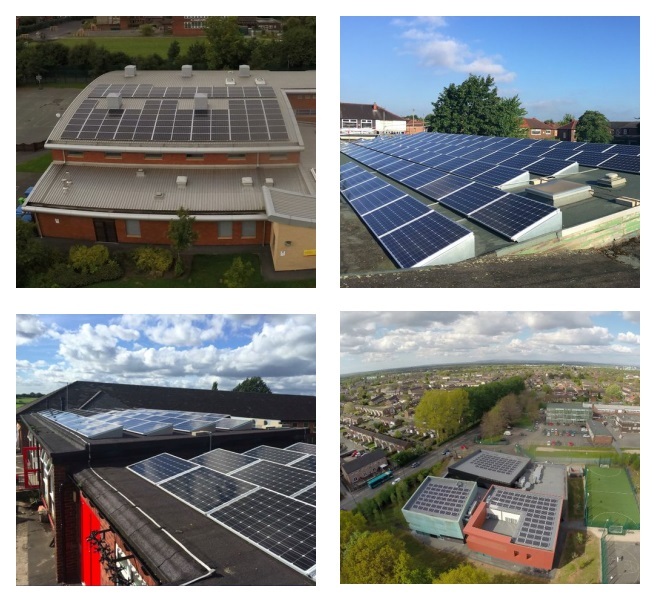 Greater Manchester Community Renewables is delighted to invite you to invest in our new community share offer to fund solar panels on four primary schools in Salford. This will help them save money on their bills, reduce carbon emissions and help the children learn about energy and climate change – and profits from the scheme will go into a community fund to support eco-friendly projects in the local area. With a minimum investment of £100, you could own a share of this exciting project.and earn share interest of up to 4% each year. In 2016, people like you funded solar arrays at Irlam Primary School, Fiddlers Lane Primary School, Primrose Hill Primary School and The Fuse (a community centre in Partington). 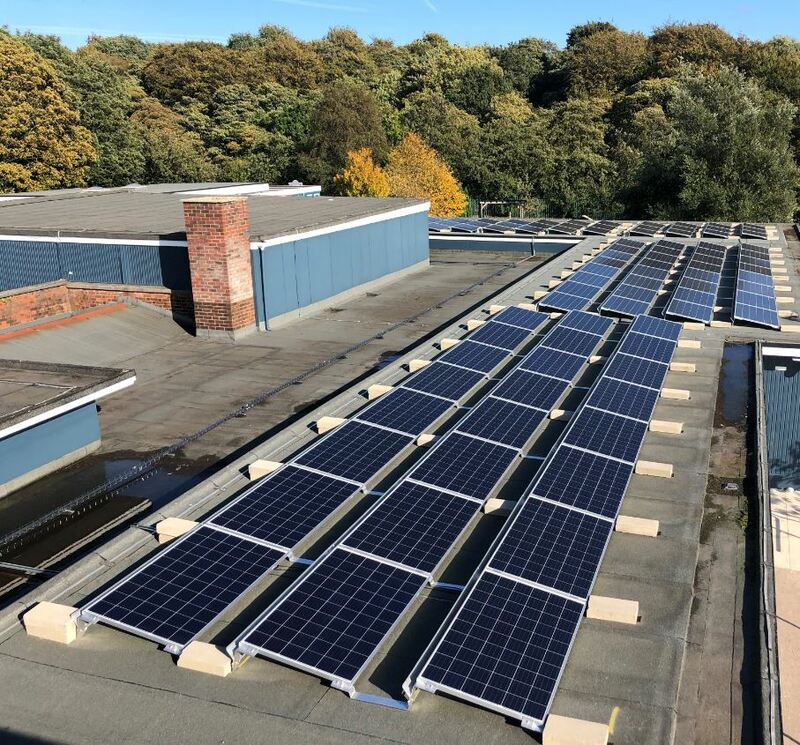 We’re now planning to install solar panels at Broadoak Primary School, Bridgewater Primary School, Light Oaks Infant & Junior Schools and Peel Hall Primary School. By adding these schools to our project, we’ll be able to prevent more carbon pollution, as well as generating an estimated £130,000 of energy bill savings and a £150,000 community fund over the life of the project. By investing in GMCR you not only help our schools go solar, you’ll also receive annual interest payments of 2.5% to 4% and get your original investment back by the end of the 20 year project (subject to performance). We look forward to welcoming you as a member of Greater Manchester Community Renewables. A new project is hoping to raise money for local renewable energy schemes whilst saving residents hundreds of pounds a year on their energy bills. Greater Manchester Community Renewables (GMCR), the group behind the scheme, says it wants to make it as easy as possible for residents to switch to renewable electricity – and save money in the process. The project has established a dedicated website – bigcleanswitch.org/gmcr – where residents can compare the price of different renewable tariffs. [ii] The organisers claim it takes less than 10 minutes to get a quote and switch. As well as helping local residents to save money, the project will raise cash for local renewable electricity projects by channelling 25% of the commission paid by green suppliers back to GMCR. [iii] GMCR director Kate Eldridge says the money will be used to help put solar panels on more local schools. GMCR already operates a number of local green energy projects, which retain the profits from generating renewable energy within the community. [iv] Now they want to help people switch to renewable electricity providers in their own homes. GMCR is one of four community projects taking part in a national pilot which aims to demonstrate the power of community groups as a positive force for change. Another Greater Manchester group – Oldham Community Power – is also taking part. The national scheme is a partnership between the Big Clean Switch campaign[vii] and Project Dirt[viii], an umbrella organisation for community projects. The Big Clean Switch is already working with the Greater Manchester Combined Authority, but organisers say that while that project communicates through councils and local businesses, the new scheme is designed to work at a local level. If successful, the organisers hope the model can be replicated in towns and cities across the country. [i] Typical saving calculated on 6 February 2018 by comparing an average usage dual fuel household on a Big Six Standard Variable Tariff (£1,135) with the cheapest tariff supplying 100% renewable electricity available through the Big Clean Switch website (£834). All prices are for a single rate meter paying by monthly direct debit, with prices averaged across all regions of England, Scotland and Wales. Average usage as defined by Ofgem is 12,000 kWh pa of gas and 3,100 kWh pa of electricity. [ii] Suppliers offering green tariffs promise that the electricity used by a home will be matched by the same amount of renewable electricity going into the National Grid. Renewable electricity is power sourced from the sun, wind, water (rivers, waves and tides) and some biofuels. [iii] Every time someone switches energy supplier through this campaign, the supplier pays Big Clean Switch a commission. This doesn’t affect the tariffs offered, which are the same price or cheaper as you’d find on the suppliers’ own websites. Big Clean Switch uses some of the money to help fund its national campaign, and shares some with its delivery partners. [v] The cheapest open market tariff for a Greater Manchester postcode on 13 February 2018 was £811 a year for a medium consumption dual fuel household on a single rate meter paying by monthly direct debit. This compares with £828 a year for the cheapest comparable tariff available through the Big Clean Switch. [vii] Big Clean Switch is part of Brakkn Ltd, a ‘profit with purpose’ company with a commitment to channel part of its profits to good causes both through the commission it shares with partners and through a corporate commitment to give at least 5% of its remaining profit to climate related causes. [viii] Project Dirt is the UK’s most active network connecting and resourcing community projects. It receives 8% of the commission paid by suppliers when someone switches, after the costs of processing the switch have been deducted. GMCR is planning a further round of solar installations for summer 2018. Before we can launch a community share offer to raise money for more solar installations, we need to check that the sites are suitable e.g. by commissioning a structural survey of the roof, and doing legal due diligence on the properties before we enter into a lease of the roof. 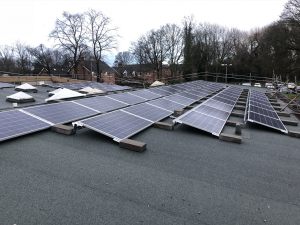 We would like to thank The Naturesave Trust for providing a grant of £1,500 towards these development costs, so that more schools in Salford can benefit from solar panels. If you’re interested in following the development of the new sites, or would like to receive a copy of GMCR’s new share offer when it is published, please get in touch or sign up for our newsletter on our home page. The Naturesave Trust is funded by the activities of Naturesave Insurance, the UK’s leading ethical insurance provider for individuals, businesses, charities and community groups. Exciting News! Generation meter readings taken towards the end of the September 2017 show total solar generation of over 100 MWh since installation across the four sites! 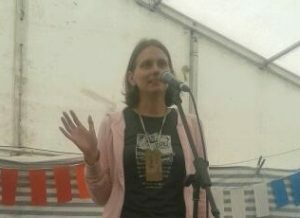 We spoke at a European Energy Democracy convergence about how we used community shares to raise funds to install solar panels. They have made a great video about the event. We also took part in a stakeholder panel on sustainability for Electricity North West (ENW). ENW look after the electricity cables in the North West area. They shared updates about the roll out of Smart Meters, and a project they are planning to help people use electricity more efficiently (so that ENW don’t have to upgrade cables to meet increasing demand for electricity). Good to see they have an incentive to help people look after the environment and their bills! 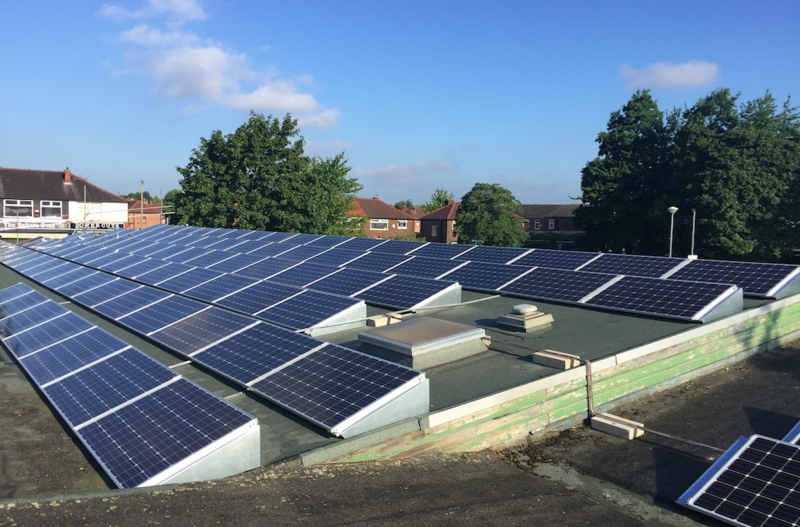 The solar installation on the roof of Fiddlers Lane Primary School now belongs to GMCR. You may recall that GMCR lent Moss Community Energy the money to install solar panels at Fiddlers Lane Primary School. It was always their intention to transfer the site to GMCR and we are pleased to confirm that all the paperwork was completed by GMCR, Moss Community Energy, the school and Salford City Council with effect from 20 June. It’s great that Fiddlers Lane is now formally a GMCR partner. 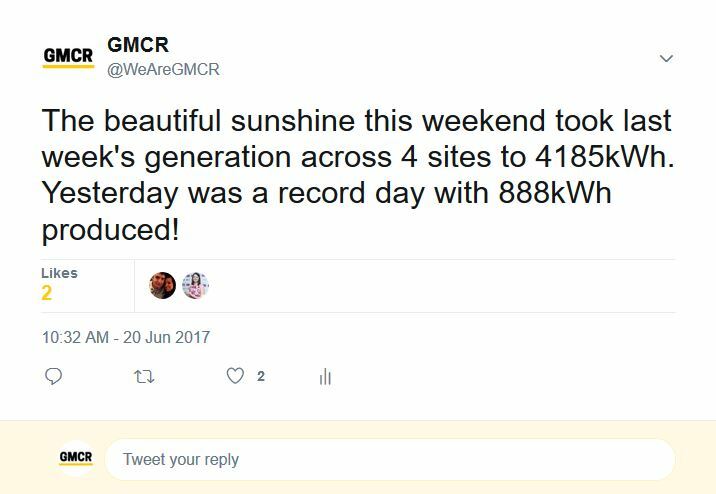 Generation meter readings taken towards the end of the June 2017 show total generation of 59,657kWh since installation across the four sites, almost triple the amount generated towards the end of March. With The Fuse now generating and the longer days, it has made a big difference! Maybe we’ll be celebrating 100 MWh later this year? 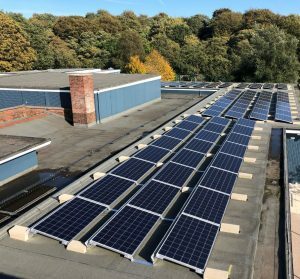 We are working with Manchester Environmental Education Network (MEEN) to amplify the educational benefits of the solar panels on our school sites. In June, MEEN supported Key Stage 1 children at Fiddlers Lane Primary School take part in an environment-themed assembly. 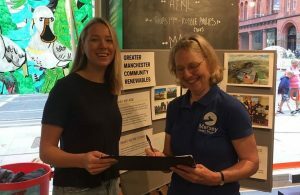 June also saw the start of Community Energy Fortnight, and we took part in a few of the events, including the Community Energy national conference which was held in Manchester this year.